Uncategorized – Page 6 – Planet Geek! But in the end, it was just fun. At times I could feel my bass thrumming in my hands as I kept the low-line on songs, and I knew the rest of the band was in tune with it and just running. My amp was right next to me on the floor, and I could feel the vibration from it pounding out low E’s and G changes that just held the songs true. 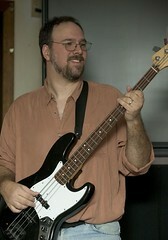 A bass guitar is almost part of the rhythm section. With the drummer, we keep the beat and the pace of the song. I work pretty well with our drummer, and at times I stop thinking about how 6 months ago I was dreaming about how much I wanted to be in a band and making this kind of music, and just settled into what we were playing. Why yes, we did get a lot of snow, why do you ask? This was a remarkable storm. I had to drive for several hours in it, and there was lightning, thunder, and almost zero visibility. At 3pm in the afternoon. At around 6pm, it just… stopped. The front moved through like a knife, and we had a beautiful sunset under rapidly clearing skies. Remarkable. I’ve driven some in some horrible weather, but this was one of the heaviest snowfalls we’ve ever had. In broad daylight it was treacherous. I can’t imagine what this might have been like at night. The forecast was for 6-10 inches. 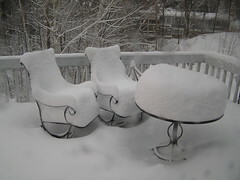 I think we ended up with about 14″ here in Natick.